Byteman owns the most beautiful garden in Bytetown. He planted n roses in his garden. Summer has come and the flowers have grown big and beautiful. Byteman has realized that he is not able to take care of all the roses on his own. He has decided to employ two gardeners to help him. He wants to select two rectangular areas, so that each of the gardeners will take care of the roses inside one area. 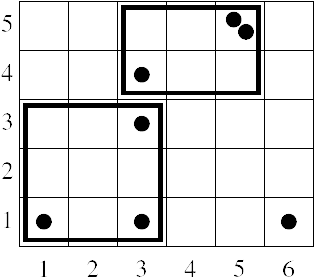 The areas should be disjoint and each should contain exactly k roses. Byteman wants to make a fence surrounding the rectangular areas, but he is short of money, so he wants to use as little fence as possible. Your task is to help Byteman select the two rectangular areas. The garden forms a rectangle l meters long and w meters wide. It is divided into l·w squares of size 1 meter × 1 meter each. We fix a coordinate system with axes parallel to the sides of the garden. All squares have integer coordinates (x, y) satisfying 1 ≤ x ≤ l, 1 ≤ y ≤ w. Each square may contain any number of roses. has perimeter 2·(l2 − l1 + 1) + 2·(w2 − w1 + 1). The two rectangular areas must be disjoint, that is they cannot contain a common square. Even if they have a common side, or part of it, they must be surrounded by separate fences. writes to the standard output the minimum sum of perimeters of two non-overlapping rectangular areas, each containing exactly the given number of roses (or a single word NO, if no such pair of areas exists). The first line of standard input contains two integers: l and w (1 ≤ l,w ≤ 250) separated by a single space - the length and the width of the garden. The second line contains two integers: n and k (2 ≤ n ≤ 5000, 1 ≤ k ≤ n/2) separated by a single space - the number of roses in the garden and the number of roses that should be in each of the rectangular areas. The following n lines contain the coordinates of the roses, one rose per line. The (i+2)nd line contains two integers li, wi (1 ≤ li ≤ l, 1 ≤ wi ≤ w) separated by a single space - the coordinates of the square containing the ith rose. Two or more roses can occur in the same square. In 50% of test cases, the dimensions of the garden will satisfy l,w ≤ 40. The standard output should contain only one line with exactly one integer - the minimum sum of perimeters of two non-overlapping rectangular areas, each containing exactly k roses, or a single word NO, if no such pair of areas exists. MichaelBroughton2 on Feb 13, 2014 - 8:59:47 pm UTC Strict Time Limit ? I've coded this problem twice, both times following what i have read to be the optimal solution. Could someone take a look at my submissions and tell me if it's me or the judge ? Alex on Feb 13, 2014 - 9:27:13 pm UTC Re: Strict Time Limit ? The time limit used to be fine before, but recently, submission running times have been really sporadic. Thus, even optimal solutions are somehow failing to pass problem time limits. I'm not sure whether this is fixable or simply an issue with server speeds. For now, the time limit has been raised from 0.50s to 1.00s. MichaelBroughton2 on Feb 13, 2014 - 10:45:46 pm UTC Re: Strict Time Limit ? Alright , thanks for the info.